Whether you are warming up for pre-show or conditioning when you&apos;re away from your instrument, this exerciser is the ultimate portable workout for you to keep up your finger, hand and forearm strength and coordination. With ergonomic design and silica gel finger palm pads, make your training comfortable. Safely and conveniently build strength, flexibility and coordination. Providing a complete strength training solution for fingers, hands, wrists and forearms. Soft silicone button cap makes it comfortable to grip and press. You can develop and maintain strength and dexterity in your fingers, hands and forearms. 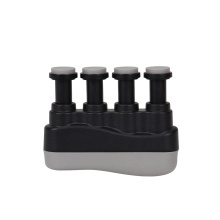 Widely used for finger exercise when you play guitar, piano or other orchestral instruments.